After being monitored for more than two months on DavidNews.com, I would like to introduce a short interview with Forex King administrator & CEO Vilhelms Balodis. As you know, Forex King is one of the strongest projects that is online these days, and it offers you to make starting from 2.1% daily profit and countless investors have already completed several investment cycles here. I must say that I appreciate that administrator has replied questions with very explaining answers and not just informs about benefits but about all the risks as well. 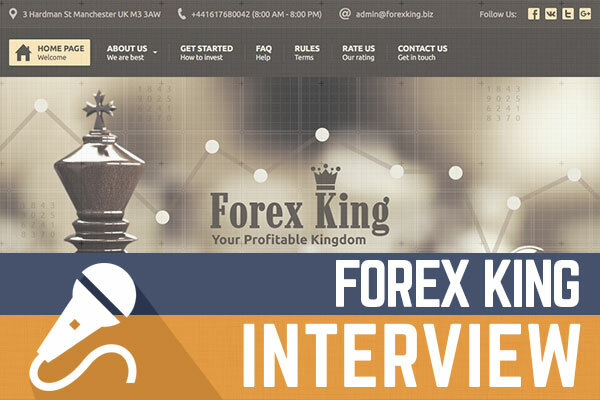 If after reading this interview you are willing to find out more about this project you can find my review about Forex King over here. So, grab some coffee or some another drink and let's enjoy the interview. Hello David and our readers, I am really glad to answer your questions for the interview. I try to provide exhaustive information about our Company and our Team. First of all I would like to introduce myself, My name is Vilhelms Balodis, I am 33 years old, with our team we have a great experience in such area as results you can see Forex King . And Yes, I am main Administrator and CEO of Forex King investment platform. Also I am second owner of Forex Investing LTD. The genuine Forex King website is property of Forex Investing LTD, use EV SSL encryption and has green address bar that confirms that the presented content is the genuine and legitimate. We have many compensative packages so Investors can choose from a variety of investment packages to invest their funds for different periods of time and receive the best revenue at low risks. We firmly believe that “every client is unique & every investment plan has to be unique”. There are three investment plans with daily basis percentage and start from $10 with “Starter Daily Plan” where you can get 2.1% Daily profit within a 15 days (Initial capital will back at the end of investment term) and up to Professional Daily Plan where you can get 2.7% Daily within a 55 Days (Initial capital will back at the end of investment term). Also we have investment plans with better percentage where percentage of your earnings is depending from the amount of deposit, They are calling Accumulator plans where you can get from 250% After 40 Days up to 1800% After 105 Business Days (Your initial capital is include to your profit). We don’t forget about our VIP investors who want to invest a large amount of deposit, Our fist VIP Plan where you can get 350% After 17 Business Days and second VIP plan where you can get 900% After 33 Business Days. It’s really great opportunity where you can get a good profit with minimal risk. You can use our profit calculator for calculate your profit. We haven’t any additional fees or withdrawals rules. You can find full information in our FAQ and Terms. Forex King has a huge name in the market nowadays supported by popular forums as well as monitors, we have never missed a single withdrawal request or any enquiry. Our future plans consist in developing the platform, we may add a new support options, new referral system and many others updates will be. All that’s going to change tomorrow because we have quite a bit to catch up on now. Also we have actively part in social networks. The main opportunity it’s positive feedbacks from our clients. We are using licensed GoldCoders script with many additional security options. As you understand we have a great experience in the market, so we have a few strategies for long term operating. For protect our investors from unauthorized access and hackers we are using Koddos dedicated server for many years, also we known that Instant payouts is more risky, so we don’t use instant withdrawals for a security reasons. Every withdrawal request will be analyzed by our operator so we will check any changes in Email or User’s ewallet information. We will try to provide a really safety system for our investors. It is a great pleasure for me to say that we are celebrating 3 years of our successful offline business and our online platform has been working since 10 September, 2015 year. In this newsletter I am going to provide our valued clients and guests with the comprehensive coverage of the achievements made during this time. In the past 180 days, Forex King has demonstrated tremendous growth which, however, would not be possible without our valued members and clients. So, first of all, I would like to express my heartiest gratitude to each of you for staying with us! I would like to notice that we have only https://forexking.biz/ website. The genuine Forex King website is property of Forex Investing LTD, use EV SSL encryption and has green address bar that confirms that the presented content is the genuine and legitimate. We are planning to add the multi language live chat for convenience of our clients. I would like to remind you that we accept most of the reliable e-payment processors including Perfect Money, Payeer, Bitcoin, AdvCash, SolidTrustPay and NixMoney. To get more details about payment methods please check our "Deposit Methods" here: https://forexking.biz/?a=cust&page=depmethods And we are permanently looking for good ways to make ours services closer and more convenient for our clients. There are many other aspects we are working on to make our company, its website and services as friendly as possible. I am not sure that you can find any other Competitor who can provide similar plans for a such long time. Many of our investors still asking us: “How can we work with such percentages for a really long time?” It’s a really good question because we are still working within a more than 185 Days Online, The running for a really long time it’s our main Goal, Our great experience and smoothly work the main advantages for such cooperation. Most of the top specialists have worked with the Company since inception, our own analytics who are employs a team of financial experts, so it is able to maintain the quality of analytics and reduce the time of data processing. You should carefully read our FAQ and Terms and Conditions. Yeah, we are talking about some risks from HYIP investment. First of all you should to invest only to Genuine Companies who still working for a long term. But, Marginal Currency Trading and Cryptocurrency Trading is one of the riskiest forms of investment available in the financial markets and is only suitable for individuals and institutions who and which have sufficient experience and track of record. We have United Kingdom based company, so we have reserve funds for protect your initial capital from investment risk. However you should to keep balance and don't invest a lot of money unless you can afford to lose it. We are getting very positive feedback from popular monitors, so we are really happy to know that we have met your expectations. We are committed to putting in all of our expertise, integrity, and sensitivity to bring you the best service. Forex King will be topflight investment opportunity in the web. Our main goal is to ensure maximal profit to each of our investors and keep possible risks to their investments at the lowest levels. So if our investors will be happy with Forex King we are also satisfied ;) Don’t hesitate to contact us via your proposal for developing our Company Let’s make Forex King better together. Best wishes to all investors. I would like to advise that you go with the most recommended Forex broker. In my consideration, the ultimate Bitcoin exchange company is CoinMama.